From NECA: This brand-new version of Ahab is based on his appearance in the Dark Horse comics. 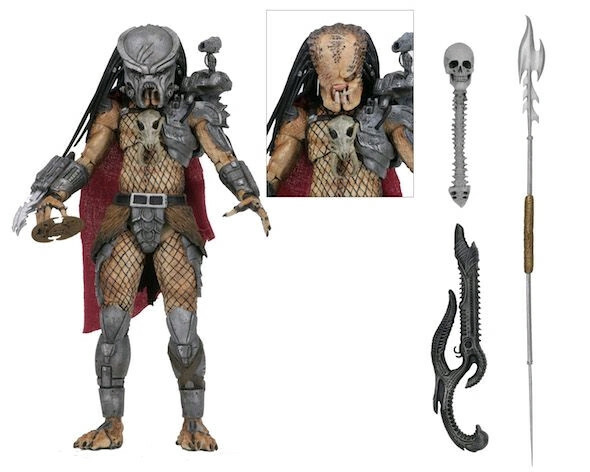 We’ve given our SDCC 2014 exclusive a massive upgrade, equipping it with the all new "Ultimate" Predator body which has added articulation in the biceps (bicep swivels), elbows (double elbow joints) and torso, plus an opening gauntlet. The Engineer Gun can be held or clipped to the figure’s back. Stands approximately 8? tall and comes in collector-friendly deluxe window box packaging with opening flap.